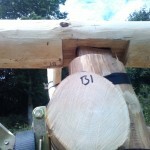 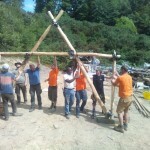 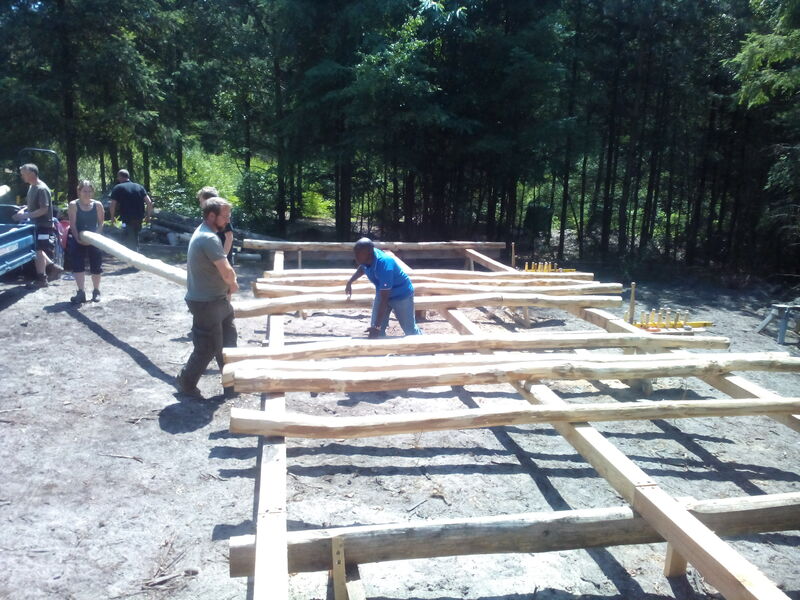 Earlier this month I attended the first roundwood timber framing course run by Artizans of Wood at the Dangstein Conservancy in Rogate. 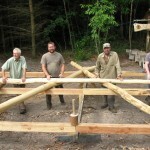 The course showed us how to construct a cruck or ‘A’ frame style building from round and somewhat irregular poles. Although it was the first course that the Artizans have run here, all the tutors had had years of experience and were trained in this style by Ben Law who came to notoriety when he crafted his woodland house for the Channel 4 architectural programme, Grand Designs. 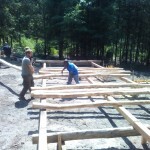 This project was to construct a 2 bay tractor shed which requires 3 ‘A’ frames or crucks. 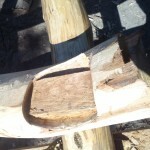 This meant the group of 12 could split into manageable teams of 4 and work on a cruck each. 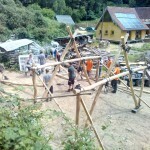 There was a real feeling of team work on the build, people had come from many different backgrounds with varying amounts of experience, but everyone seemed to enjoy the challenge and the feeling of satisfaction was palpable in the group as each joint went together, then each frame and on the final day, the frames were all raised and fixed firmly with oak pegs. 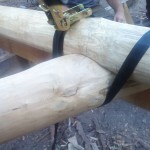 The artisans are so passionate about their craft, this was obvious from the first day and maybe this is why they all seemed so at ease in putting across a sometimes difficult subject. 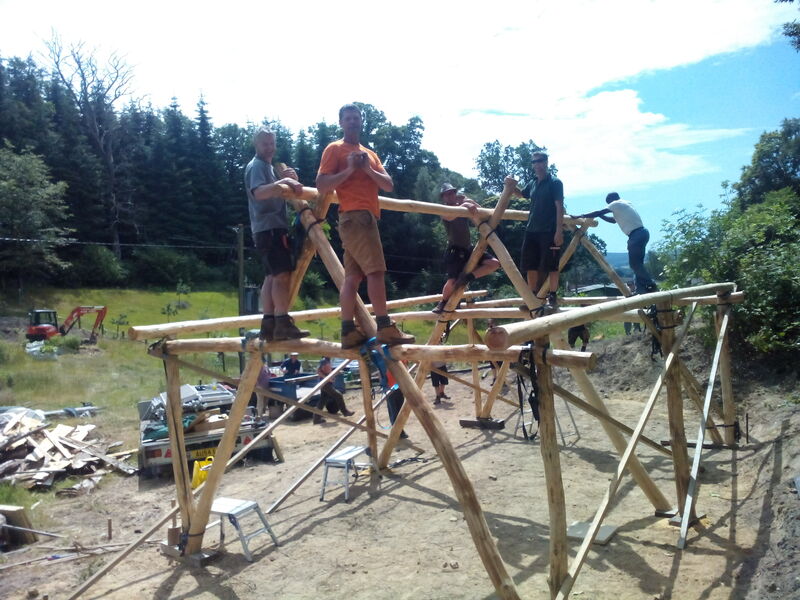 Along with all the other attendees, I found myself being thoroughly engrossed in the whole process and would recommend it to anyone with an interest in natural sustainable building, or who just wants to make a simple shelter in their woods. 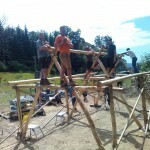 Attending this course will inspire you! 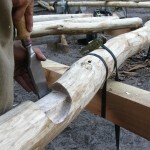 Visit the Artizans of Wood website for more information about what they do or to book on a course.